Disclosure: This post has been sponsored by Vital Proteins but all opinions expressed here are my own. 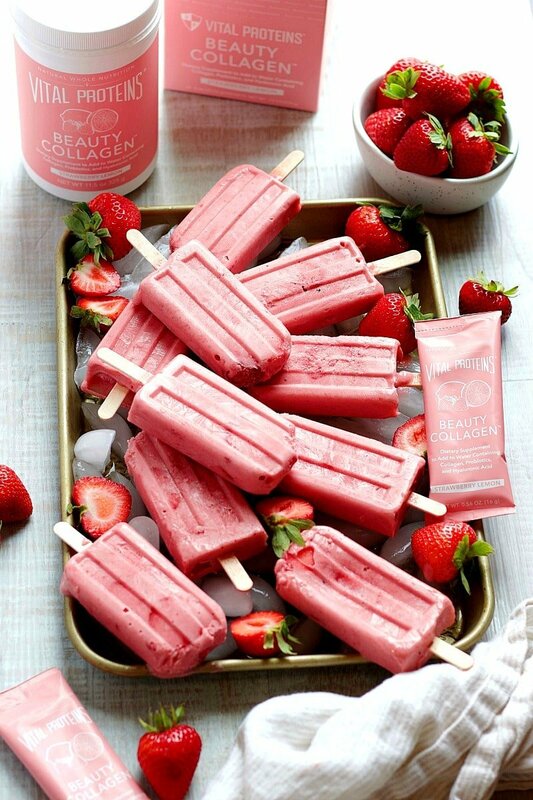 Healthy and MEGA refreshing Strawberry Yogurt Popsicles, only 3-ingredients PLUS Collagen! An irresistible summer treat that is also good for you! I love summer heat and value all the outdoor time I get. As a girl who lived most of her life in Brazil, every bit of sun we get in New England is more valuable to me than a stroll down on Copacabana Beach or free tickets to Carnaval! But August heat (and humidity) can be exhausting even for this S. American girl. Yikes! 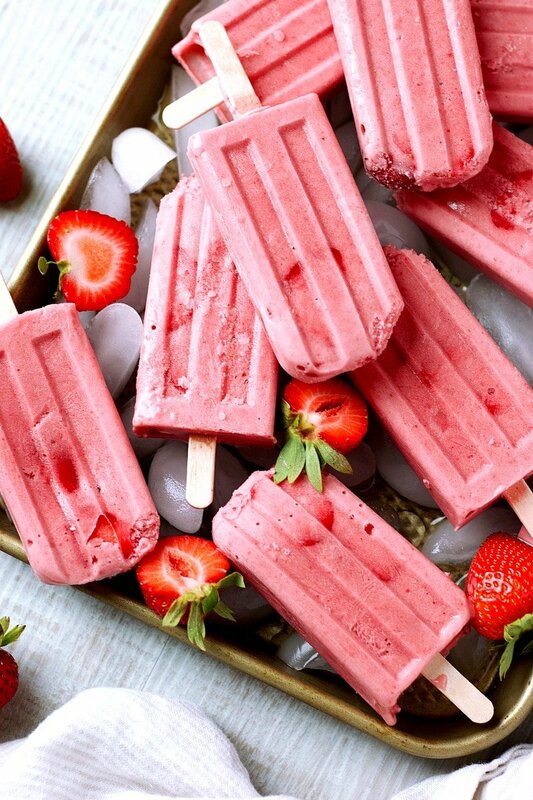 Ever since I was a little girl I heavily relied on popsicles not only to cool my body down, refresh, hydrate but also as an additional source of nourishment. Back then my favorites were coconut, mango, avocado, cocoa popsicles (from the actual cacao tree!) and açaí were a few of my go-to flavors, especially because these fruits were available on my own backyard. While our weather in Massachusetts don’t allow for mango or avocado trees to grow, I still manage to maintain a productive fruit and vegetable garden during the summer, and make popsicles from what I grow in my backyard. As per usual, with few ingredients, no refined sugars and pure fruit taste, just as it should be. Having the ability to control my ingredients, the concentration of the fruit and any added nutritional value I want, is what I have always loved the most about making my own popsicles. For me every meal, snack or drink is an opportunity to nourish and replenish my body. Which is why I use Vital Proteins® Collagen Peptides on a regular basis. As we age, our body’s natural ability to produce collagen starts to decline. This reflects on our skin, hair, nails, joints, ligaments, muscles, and much more. Replenishing my body with this missing protein is essential and can be a lot of fun too. Incorporating Vital Proteins Collagen to your diet is very simple and rewarding! 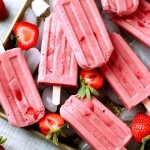 To make these delicious, healthy and refreshing Strawberry Yogurt Popsicles I used Vital Proteins Beauty Collagen in strawberry lemon flavor. This collagen does not affect the consistency of the popsicles nor will leave a weird taste, and it’s a great added piece of supplementation to take this summer treat to the next level. Just remember, when Mother Nature turn the temperature up, you can cool down your internal engines with these cooling popsicles that are also good for you! 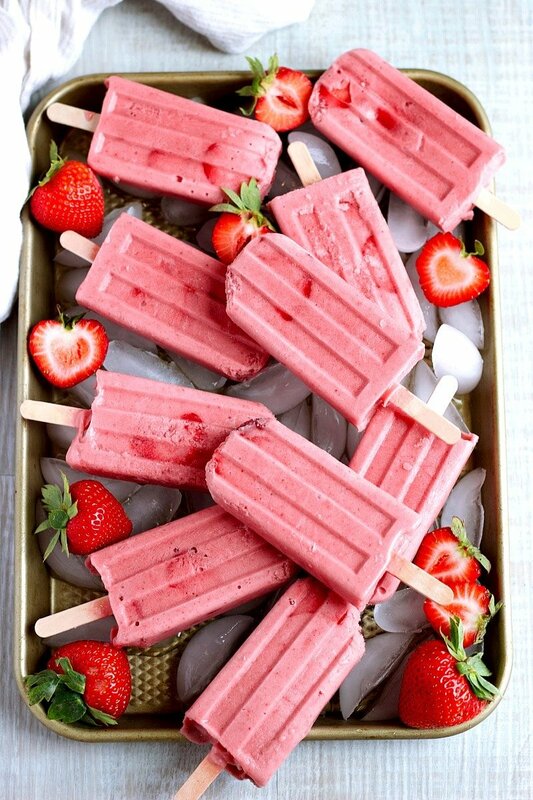 Healthy 3-Ingredients + Collagen Strawberry Yogurt Popsicles! Add all the ingredients including the Vital Proteins Strawberry Lemon Collagen to a high speed blender and work it for about 1 minute or until the you reach a creamy consistency. Transfer popsicles to the freezer and allow them to freeze completely before serving (mine took about 4 hours). *you can substitute for any yogurt of choice, including non-dairy choices. Coconut, vanilla and strawberry flavors work best! **this will depend on the type of popsicle mold you have. Your process might look a little different than mine.